You’ve probably seen dark brown or reddish tear stains under a dog’s eyes and wondered where they come from. Tear stains appear in certain breeds more often than others, and they can indicate a lot of different things. It’s important that you see a veterinarian or eye specialist if your dog is developing tear stains to determine the cause and possible treatments. 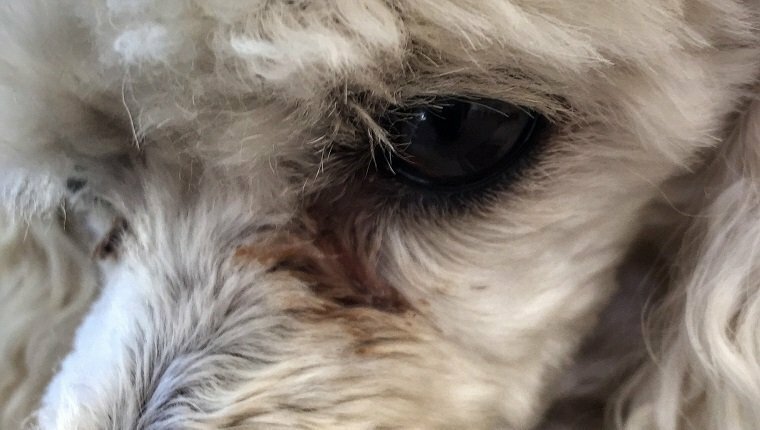 Here’s what you should know about tear stains under dogs’ eyes. Tear stains are dark brown or reddish marks that appear beneath a dog’s eyes. The stains are often accompanied by discharge, but not always. 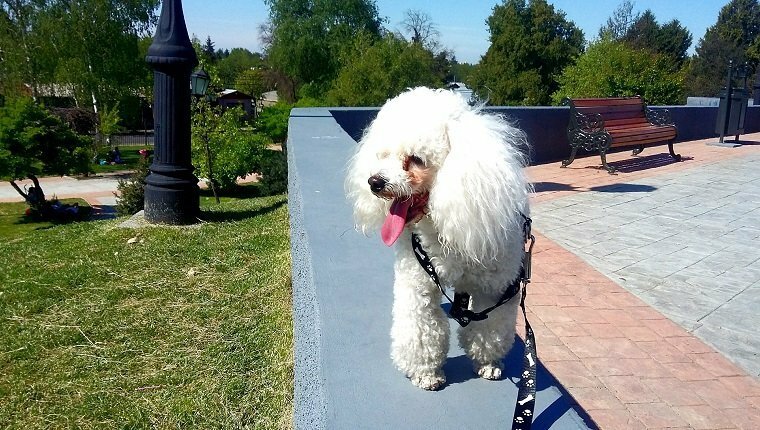 They are typically more visible in dogs that have white or lightly colored fur. Epiphora, a condition that comes from excessive tear production or the inability to properly drain tears, is usually the source of the stains. Epiphora can have a variety of causes and can be acute or chronic. The reddish stains appear when porphyrin, a pigment found in tears, accumulates under the eyes. Stains that are brownish or rust colored may be the result of a yeast infection on the skin under the eyes that is able to thrive because of the constant moisture from tears building up on the skin. Because the causes of epiphora can vary, it’s important that you see a veterinarian or specialist. The excess of tears results from eye irritation or from your dog’s eyes being unable to drain tears properly. The eye produces tears to flush irritants and stay clear. Normally, tears are then drained away through small holes near the eye and sent down the throat. Epiphora is the result of abnormalities in this process. Glaucoma- Causes fluid buildup in the eye and damages the optic nerve. Conjunctivitis– An inflammation in the lining of the eye that can result in mucous, pus, or discharge. Eye infections– Caused by bacteria, viruses, parasites, or irritants like smoke or shampoo. Irritant exposure- Secondhand smoke, dust, and allergens can cause eyes to produce more tears. Teething- In puppies, teething can be accompanied by excessive tears. Ingrown eyelashes– Usually hereditary and appear more frequently in certain breeds. Inverted eyelids- Entropion is a condition where a portion of the eyelid is inverted, resulting in eyelashes rubbing against the eye. This causes irritation, scratches, and eye damage. Shallow eye sockets- More common in brachycephalic dogs (dogs that have shorter snouts). The eyes bulge out and sometimes eyelids don’t fully close, which results in irritation and damage. Ear infection– An infection in one ear can cause the eye on the same side of the head to produce tears more than usual. Large tear glands or small tear duct openings- Irregularities of your dog’s eyes can cause more tears. Scarring- Scars from past eye infections or eye damage can affect the ability to drain tears, causing build-up. Improper diet and stress- Lifestyle has an effect on epiphora. Consult your vet to form a balanced diet and work to reduce anxiety. A grain-free diet may work. Allergies- These can cause your dog’s eyes to produce excessive tears as the body responds to what it perceives to be a threat. These can be seasonal, food related, or the result of using plastic food and water bowls. Which Dogs Get Tear Stains More Often? 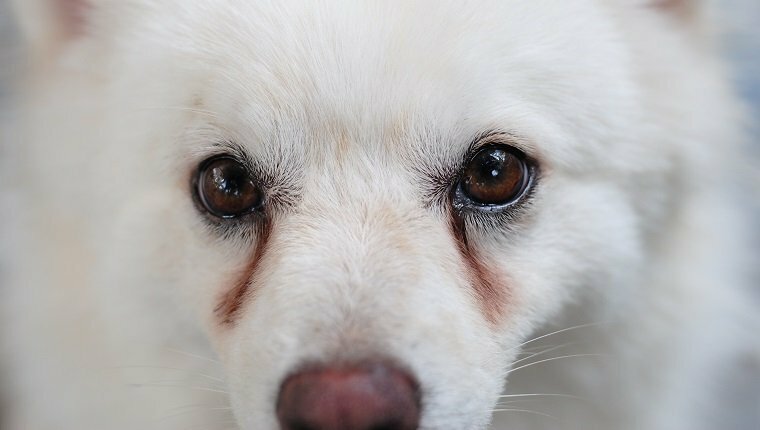 You may notice dogs with white or lightly-colored fur have tear stains more often, but this is mostly because the tear stains are just more visible against those colors. Dogs with dark fur can be just as likely to develop epiphora, and you should always examine your dog’s eyes closely for anything out of the ordinary. Some breeds, however, are more likely to develop eye problems as the result of heredity and genetics. Brachycephalic dogs tend to have shallow eye sockets, which can cause the eyes to bulge. Sometimes the eyelids can’t fully close, leaving the eyes exposed to irritants, dryness, and damage. You may especially notice the inability to fully close the eyelids when your dog sleeps. 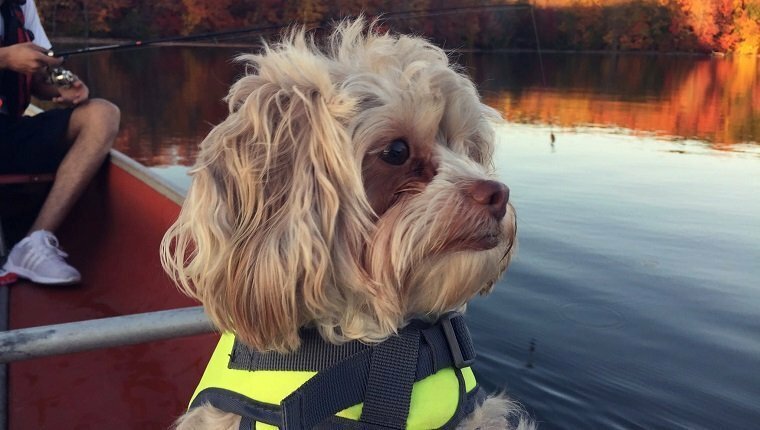 Shih-tzus, Pekingeses, Malteses, and Pugs are among the short-nosed breeds that commonly develop eye problems. 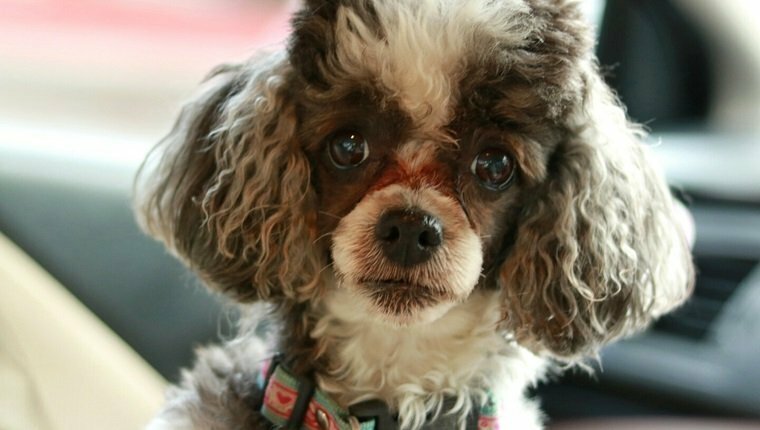 Poodles and Cocker Spaniels, along with other breeds, are more genetically likely to have imperforate puncta, a condition where the holes near the eyes that drain tears do not properly develop. This causes tears to build up, and the stains are more likely to form. Treatment for epiphora is as varied as the causes, which is why you must see a veterinarian or eye specialist before you attempt to treat it yourself. Your vet will determine the cause and form a plan to treat the condition. If the cause is an irritant, a simply eye flushing may be enough to reduce tear production. In cases of an eye or ear infection, you might be provided with medicated drops or antibiotics. For genetic conditions or issues with eyelashes or eyelids, surgery or electrolysis could be required. If the cause is allergies, you may need an antihistamine or a change in diet. When stress or poor diet are the causes, you’ll need to discuss some lifestyle changes with your veterinarian, which will probably include more exercise and switching to a grain-free diet and a non-plastic food bowl. Do not switch to a grain-free diet without talking to your vet, as it may be linked to certain heart conditions. 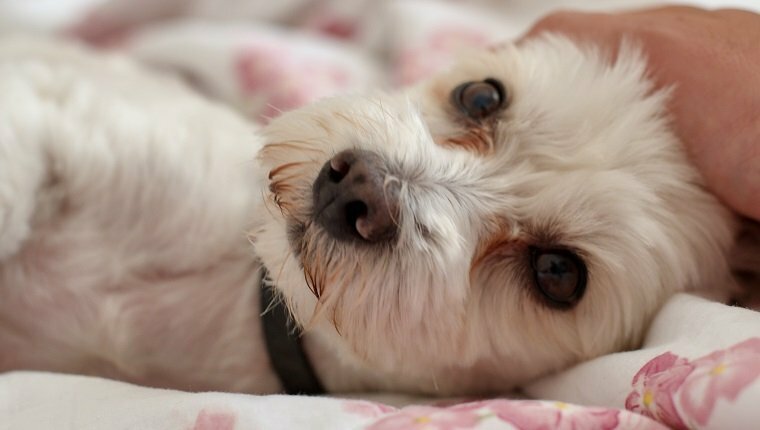 In the meantime, you can take steps to make sure your dog is more comfortable. 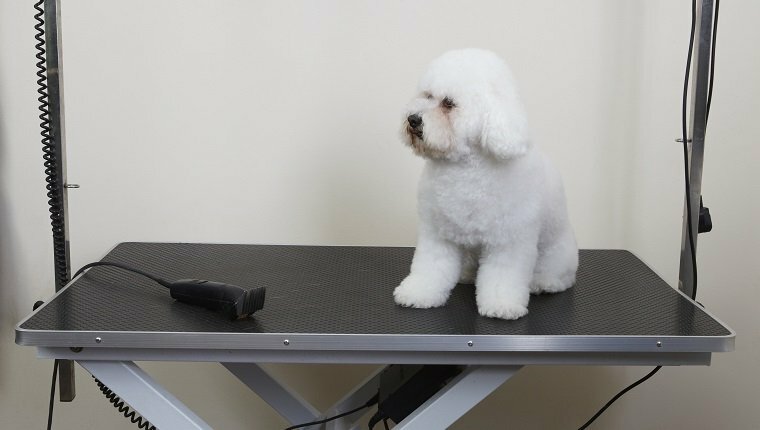 Keep the fur around the eyes trimmed so that it doesn’t cause irritation. Clean the area affected by excess tears with a paper towel soaked in warm water. Use a dog-safe eyewash to remove irritants, and you may want to consider an Elizabethan collar if your dog is pawing at their eyes to avoid further damage. As for removing the stains, there are many products on the market that claim to do so. Usually these are a waste of money and can even be harmful to your dog. Generally, wiping away the tears frequently will reduce the presence of porphyrin, the pigment that causes staining, as well as any yeast infections that might occur. You can clean the fur with colloidal silver, which is safe near the eyes. Some suggest that switching to filtered water can help, as well as adding apple cider vinegar to your dog’s food, though you should consult your vet to determine the right amount to add. Products that are not safe around the eyes include hydrogen peroxide, topical vinegar, and makeup remover. Do not use these products near your dog’s eyes. 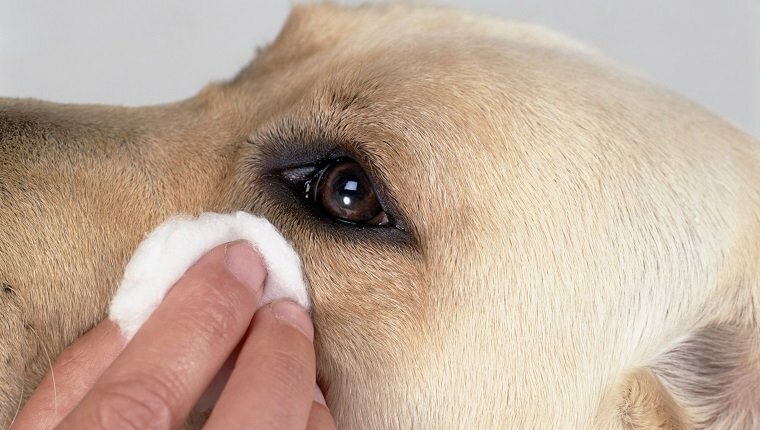 Does your dog have tear stains under their eyes? How do you treat them? Let us know in the comments below!